Military and guns in Costa Rica | Travel Smart! The military of Costa Rica has been abolished in 1948. In the same time, citizens of Costa Rica are allowed to buy guns and weapons, with a registration of course. 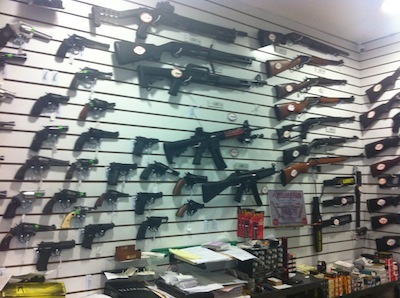 This is a picture taken today in a gun shop in San José, Costa Rica. we need for some movie shoots at costa rics (june 2014) some very good imitations of Guns and Pistols to buy or to rent there. if you have an idea where we can get it, pls. letus know. thx. I don’t have any idea unfortunately. Thanks for your interest.